PES 2015 is currently on display at Brazil Game Show in São Paulo and following the reveal about German Bundesliga teams Borussia Mönchengladbach and VfL Wolfsburg, we just got confirmation about the inclusion of the Olympiastadion Berin in PES 2015 thanks to a photo from the show. 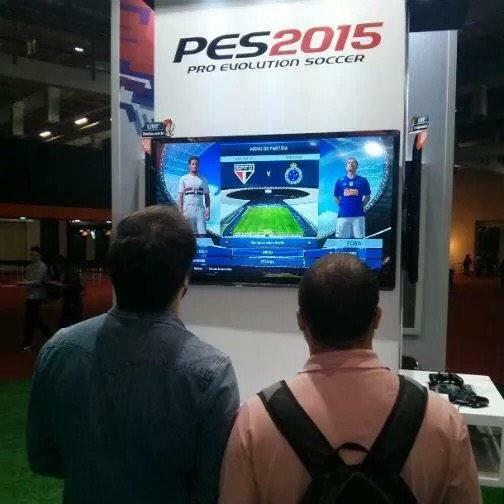 This screen from BGS 2014 is confirming the presence of the stadium in PES 2015. The 2015 Champions League Final will take place in Berlin and there was also a photo of it as background screen in the Pro Evolution Soccer 2015 Demo, building up speculation about its inclusion. As a photo of the Warsaw National Stadium (2015 Europa League Final) was also used in the demo, it seems likely it will also be in the final game.